Why Call a Qualified Locksmith? Many people use the services of local handymen instead of qualified locksmiths believing that they’ll get the job done more affordably. However, as many home and business owners have realised from first-hand experience, there’s no substitute for the work that a qualified locksmith performs. A licenced locksmith provides better quality workmanship and can provide customers with a warranty covering their workmanship and products, something that a local handyman can’t. What’s more, as qualified locksmiths are more efficient and will get the job done in a more timely manner, the higher rate they charge is offset by spending less time on the job. That means you get better quality work, workmanship and warranties that provide peace of mind at roughly the same price, but as you’re covered and needn’t pay for corrective work in the future, you’ll save money in the long run. What Problems Could Arise by Using a Non-Qualified Locksmith? An unqualified locksmith lacks the required skills, training, qualifications and experience to provide you with professional locksmithing work that delivers the degree of protection that you deserve. 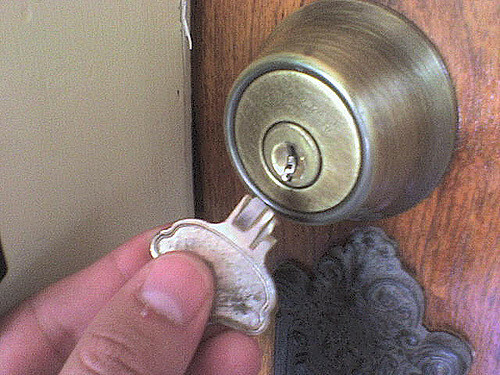 If you had a non-qualified locksmith gain entry to your property if you were locked out, they may use incorrect techniques to open the lock and damage its internal mechanisms. This may be instantly noticeable and you can get the lock replaced straightaway, though if the damage wasn’t immediately apparent and the lock wasn’t replaced, it would compromise the security of your home and place your family at risk. In Western Australia, all locksmiths must complete a four-year apprenticeship before they receive their full qualifications that enable them to provide professional locksmithing services to customers. At Action Lock Service in Perth, all our local locksmiths are experienced and fully qualified, having undergone the training, both onsite and in the classroom, required to become a qualified locksmith. A skilled locksmith who’s undertaken the training and hands-on work experience necessary to providing reliable locksmithing services is someone you can trust to provide you with the right advice about your locks and home security. No matter where you reside in Perth, whether that’s Balcatta or Dalkeith, every door and window must be secure, as your overall home security is only as strong as its most vulnerable access point. That means only a licensed locksmith should be entrusted with the responsibility of advising you on your locks and home security requirements.